Jaeda Claybrooks, 17, has found a home and is now ready to graduate. A year ago, Jaeda Claybrooks was a junior at Lewis and Clark High School who slept on a recliner in a packed one-bedroom apartment. Her mom died of cancer months earlier, leaving her without any parents. Homework and going to class, she says, were the last things on her mind. 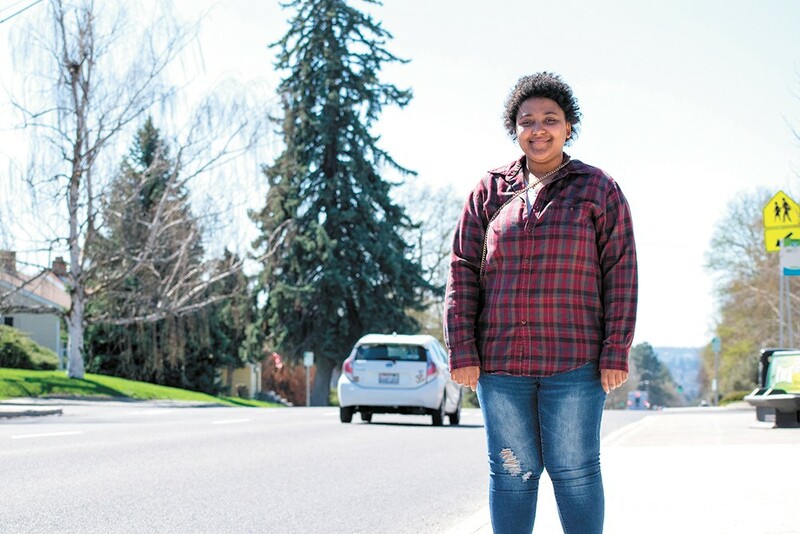 "It was like, school doesn't even match up with what I'm going through right now," Jaeda tells the Inlander. That's when she met Danielle Duffey, a homeless education community specialist for Spokane Public Schools. Duffey says she knew Jaeda needed someone to keep her on track. She helped her get health insurance and mental health care. She kept up on Jaeda's grades and attendance. And mostly, she built a relationship with her. Today, Jaeda, 17, is ready to graduate. And Jaeda gives the credit to Duffey. "I told her yesterday she's the catalyst for all the good things that have happened in my life so far," Jaeda says. Duffey's position in Spokane Public Schools didn't even exist until four years ago. In 2014-15, the district began hiring social workers to serve as a point of contact for homeless students, beyond what was required under the law. It's been a relatively unique approach among districts in the state. And so far, the district has seen results, says Brett Dodd, Spokane Public Schools special programs coordinator. Immediately, the graduation for homeless students shot up by 15 percent in 2014-15, up to nearly 75 percent, where it's hovered ever since. It's one of the highest graduation rates for homeless students in the state, and more than 20 percent higher than the state average. "Our primary focus is: How do we connect students experiencing homelessness with adults, with academic support and get them walking at graduation?" Dodd says. Federal law requires each school district to have one liaison to provide services to students who are homeless. That includes students living with relatives, in motels, shelters or kids not living with their legal parent or guardian. In Spokane Public Schools, the liaison, Sarah Miller, used to handle all of that for the district's HEART program (Homeless Education and Resource Team). However, it meant that most high schools did not have a designated social worker to help homeless kids. The district, Dodd says, wanted to change that. "We as a district decided to have a point of contact in every building so we can be aware of supporting those kids," Dodd says. In 2014-15, the district hired Duffey as a HEART community support specialist. The next year, it entered into a partnership with Eastern Washington University to place students getting their master's of social work in an internship in the HEART program. One of those interns turned into the second full-time HEART support specialist, Tracie Fowler, funded by a grant through the Washington Office of the Superintendent of Public Instruction. The bulk of the students Duffey and Fowler serve are in high school. Between them, they have 285 clients between four high schools — Rogers, North Central, Lewis and Clark and Shadle. They're alerted that a child may need help by counselors, teachers, social service agencies or sometimes word-of-mouth. From there, they assess how engaged the students are in school, then respond to their educational needs. Their job isn't to find homes for students. Instead, they make sure students are able to succeed in school. That can mean finding them transportation to school, helping them get on food stamps, helping them find clothes and food, or getting them health insurance. If the student wants to play sports, the HEART specialist will make sure they can do so. If they need a tutor, they'll find one for the student. It can be the difference between a student dropping out or finding a way to stay in school, Fowler says. "When students are in extreme crisis because of lack of housing or food, I've seen them revert to all-or-nothing thinking," Fowler says. "Like, 'there's no way I'm going to get my grades up so I'm just going to drop out.'" Fowler says they don't know there are options. The school can pay for their food, for example. Or they can work something out with a teacher to get caught up on homework. For Jaeda, it was the exact push she needed during a difficult time. Duffey immediately recognized that Jaeda needed someone to talk to when they first met. "She didn't really have a relationship with anybody in school," Duffey says. "And that's important, to have an adult in the school that you trust and you can talk to." Jaeda started missing class when she lost her mom. In her small one-bedroom apartment she lived in with several relatives, she says she didn't have any space to grieve for her mother. To cope, she used drugs with her friends at Lewis and Clark, smoking weed before, during and after school, she says. "I definitely used because I was hurting a lot emotionally," Jaeda says. Duffey referred her to a mental health therapist at Lewis and Clark. When she learned that Jaeda's living situation became "volatile," she introduced her to the Jonah Project, which helped Jaeda find a place to live. Then Jaeda went to Daybreak Youth Services for drug treatment, where she completed credits for school and got sober. They decided On Track Academy would be the best school to finish her remaining credits to graduate. After completing those courses, now she's just waiting to walk on stage and grab her diploma in June. She's hoping to attend college in the fall. "She changed my life," Jaeda says of Duffey. Duffey and Fowler say the district might benefit more from hiring more HEART community specialists like them. They feel their work is helping the graduation rate, but that they're "stretched really thin" right now, Duffey says. With student homelessness a continuing problem, Duffey says ideally there would be one specialist for every school. The original print version of this article was headlined "Beating the Odds"